The week long first term school holidays is a time for school going kids to rest, celebrate and enjoy. There is several special events during the school holiday period, and the mascot appearance of Pink Fong, Baby Shark, Didi and Friends is not to be miss. Grab this opportunity to have a close up photograph session with these adorable mascots. This event is brought to you by Digi, the Spring, Astro and Pink Fong. Event: Every day is an adventure ! Family and children crowd the event venue during the song and dance performance. Didi and Friends is one of the famous animation cartoon for kids entertainment. Their tag line is “Fun Edutainments cartoon for kids”. It was created by a company called Digital Durian. The three main character are Didi, Jojo and Nana. All three of them are anthropomorphic chicken that sing and dance along with nursery rhymes that is adapted from famous classical nursery rhymes. During the event, the mascot appearance of the three main character – Didi, Jojo and Nana – creates a hype among the kids. Lucky kids are chosen to dance on stage with Didi. Song and Dance are performed in malay edition of famous nursery rhymes such as Bingo, Tayar Bas (The wheels on the bus) , Kalau Rasa Gembira (If you’re happy and you know it), Lompat Si Katak Lompat. Interaction song and dance activity with Didi and friends. Pinkfong was first created in korean under the children’s education brand of SmartStudy. It was globally well known for their children song “Baby Shark”. 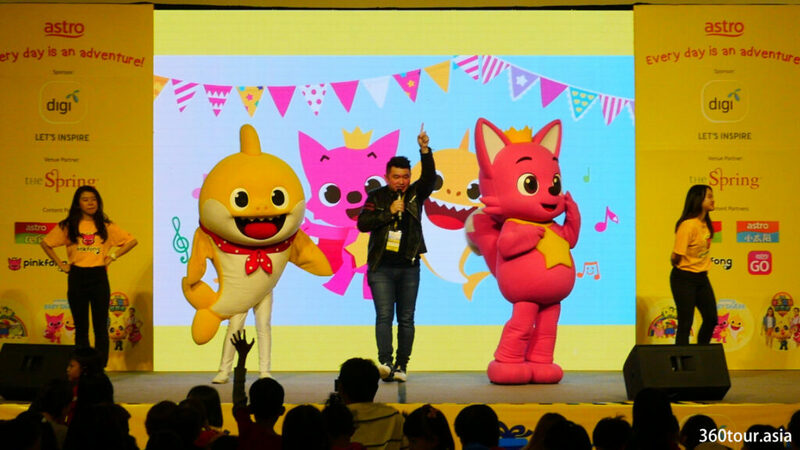 Pinkfong also famous for many of the upbeat children songs and nursery rhymes. The Pinkfong company have more than 4000 games, children videos and apps to date. The appearance of Pinkfong and Baby Shark in tHe Spring Mall is one of the major highlight that even tourist from other part of Sarawak and even Brunei came to have a close up with their favorite cartoon character. The song and dance performance includes the famous Baby Shark Dance, Jungle Boogie and Police Car Song. The grand finale ends with the baby shark remix with pinkfong shuffle on stage. Dance along with Pinkfong and Baby Shark.